The impression X4 S packs a real punch in a compact and lightweight body. 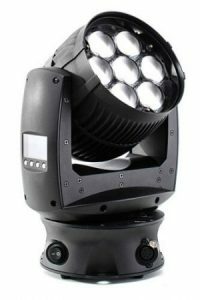 It�fs small size does not give way to any compromise though, as the heart of the impression X4 S features seven high powered RGBW LED�fs, each rated at 15 Watts, that combine to give a homogeneous output across its entire beam range. The zoom itself offers flexibility in a tight beam mode and also as a smooth edged wash light. A ratio of 7:1 provides a variable beam from 7�‹ and all the way to 50�‹. Full control over the quad color LED�fs is done via DMX, with additional control over color temperature as standard. The X4 S features precise full range dimming with no color drift at low intensities and a variable speed electronic strobe. But the unique feature of the Impression X4 S is the ability to control the intensity of each LED individually, allowing you to program unique looks and animations on the fly. Physically the impression X4 S measures just 12�� tall and weighs just 12 lbs. Rubber feet mounted to the base allow it to stand on its own, or for hanging there are threaded sockets in the base allowing clamps to be directly inserted into the unit and keeping rigging height as low as possible. The elegant design of the X4 S contains a yoke mounted LCD display for addressing and configuring each unit, with the base section containing data and power connections. The X4 S contains an auto sensing power supply from 100-240V at 50 or 60 Hz. with Neutrik Powercon in and thru connectors.